In College I used to hang out with some of the coolest musicians in the world. Jonathan Mayer(this one didn’t date Taylor Swift) and Fritz Schindler. They recorded a few Christmas tunes years ago and every once in awhile I’ll play them. 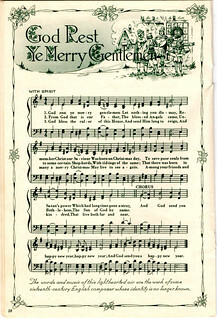 God Rest Ye Merry Gentlemen is one of my favorite Christmas songs. I love the simplicity of the melody and the simplicity in which this song proclaims the Joy of the Gospel. Be Blessed my Friends and May Christ give you Comfort and Joy.